Okay, this is a variation on the 'Blank of Borg Thread', but it has numerous possibilities and the WC forums do need a hefty injection of input to keep them alive, so come on people, so stop lurking and get involved. I'm Nuts of Oz and I have a few kangaroos loose in the top paddock. I am Jafo of Oz and I can only spell English properly when it's Aussie slang. Get the idea? Thing is, it can be about any Aussie members, other members or just various folk in the news, ect. but hey, get involved and have some fun.. orright. I am Trump of Oz and my last visit to Ashley and Martin went horribly wrong. They used some of my pubic hair to transplant onto my head and now everyone's calling me a dickhead. It is a brave soul indeed who dares to fart while bending over. Dave: I am DaveRI of Oz, and I bent over at an inopportune moment and blew a koala out of its tree. Sydneysiders: I am Sydneysiders of Oz, and I caused a massive stir when I went skinnydipping in Sydney Harbour during peak hour. Jafo: I am Paul of Oz, and at my age my legs get oh so tired pedalling around town, so these days I latch on to the back of a Melbourne tram and free-wheel about the place. Me: I am starkers of Oz, and my wardrobe is empty bar the raincoat I open up to give li'l old spinsters a bit of a thrill. I have my ways.... and spies. I mean, a bloke has to know what's going on in Sydney, what's being plotted before this year's State Of Origin series. Not only that, Channel 9 censored their footage, blanking out bits 'n pieces.... and I had to be sure it was you. I are up and down of Oz. First the downs but them was trumped by the ups. 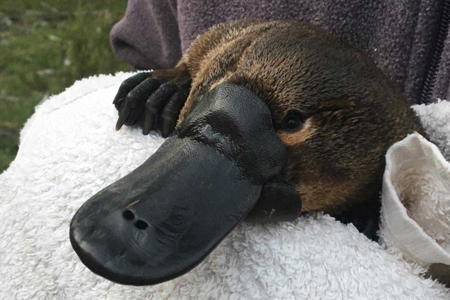 I am Platypus of Oz, and I am so very, very confused ... and yet so darned handsome. I am Zeke of OZ and confusion is my forte. I are Contraction person of OZ. I can do stuff. I am Uvah of Oz and I plaited my puss, now it looks like Bob Marley with all those dreadlocks. I am Plaited out of OZ. Eight felines are hard to do all at once. I am the "James Bond" of OZ. I am Ian Fleming of Oz and I didn't write you into the Oz story because you drink too many martinis and shagged too many beautiful women elsewhere in the world. I am Shutdown of OZ. I made history. I am Trump of Oz and somebody called Cyclone blew my thatched roof off and revealed the chrome dome underneath. As for the women! You are only jealous. I am James Bond of OZ and I do not drink martinis. If you don't drink martinis then you are a James Bond imposter. I are starkers of Oz, and having my 'wares' on show got me more women than I could poke a stick at. I am Geoffrey Rush of Oz and I'm gonna sue, sue, sue until I have all your money. I are Prince Phillip of Oz, and the missus said that I'm getting too old to take the Range Rover out for a spin, but I showed her... well sort of.